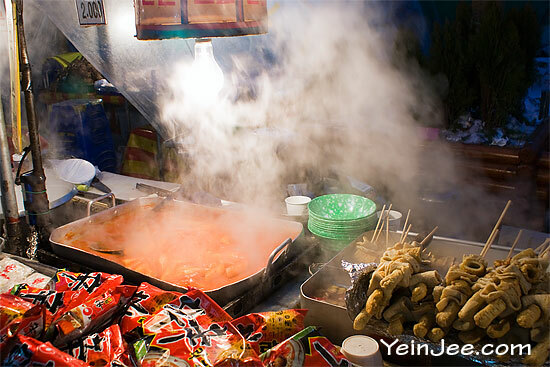 Popular snack food; had these at a street stall in Namdaemun market. 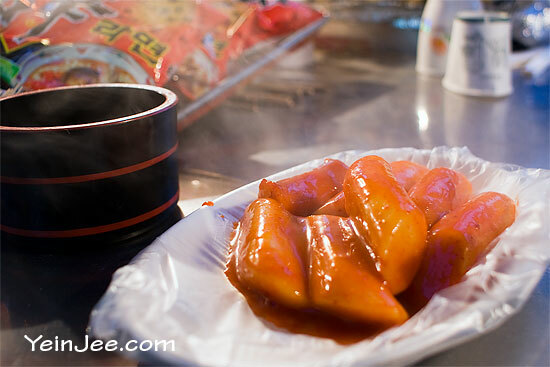 Tteokbokki are sliced rice cakes broiled in sweet-spicy sauce; while odeng (or eomuk) are boiled fish cakes which probably originated from Japan. Love the tteokbokki, surprisingly chewy, not too spicy; the odeng was a bit soggy, but the soup damn nice. Two dishes at 4000W (~US$4), pretty cheap and filling; it’s more like a full meal instead of snacks from my point of view. 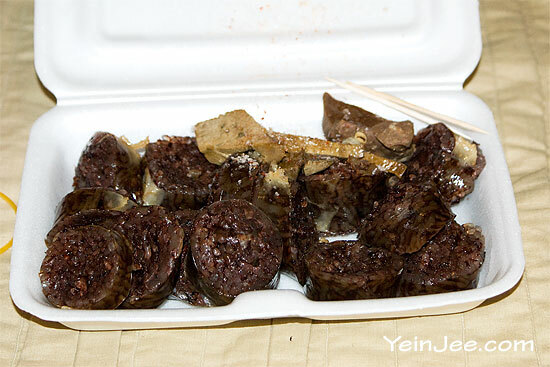 Jajangmyeon, literally fried-sauce-noodle, normally translated as black-bean-sauce-noodle. Originated from China but pretty much evolved into a style of its own. 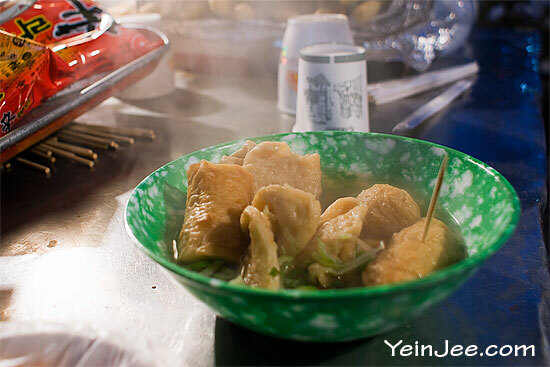 The Chinese version is noodle with thick meat sauce, whereas the Korean noodle comes with plenty of onions and some potatoes. The taste is different anyway. The noodle was ok, but had a really hard time digesting all the onions… stomach ache all night long, and bad breath until the next morning. Bought this (2000W) at a street stall in Sungin-dong. Looked a bit gross (my photo obviously doesn’t help), but didn’t taste as bad. It’s like eating jelly with mild meaty taste; decent aroma, but a bit bland tasting wise. There are other cooking methods for sundae; will try those versions if I have the chance.